Ultra clear soft cover case enhanced by a shining chrome-plated effect on the edges. 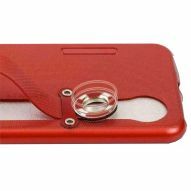 Easy to fit and remove, this compact, elegant and stylish cover case features a modern design and a ultra slim profile. It protects your smartphone from scratches, bumps, falls and dust. Easy access to all controls and ports, cutouts for speaker, microphone, camera lens and charger.